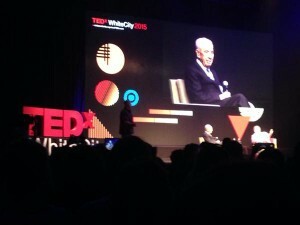 Today I attended the TEDx White City (Tel Aviv) event. What a great day of innovative speakers. The highlight of the day was listening to ex-President Shimon Peres being interviewed. Firstly, the man is already 92 years old and carries himself with such upright dignity like that of a 40 year old. Secondly he is still so sharp and with it. What an inspiration. Not only that, he is so advanced in his Hi-tech knowledge! It was truly a gift to hear him speak. I think that by the age of 92, one comes to a place in ones life of absolute wisdom. This shone through as he spoke. Here are some of the ideas that he share with the audience of about 1800 people! So much of our energy is drained and consumed by the past. If we want to step into our futures, we can’t wake up each day carrying a ball and chain from yesterday. This will slow us down. We all have amazing potential and if we would believe in ourselves enough we would be capable of achieving so much more… The sky is the limit! Don’t get to the end of your life and have regrets. We don’t know when that time will be so I guess, don’t get to the end of your DAY and have regrets. None of us are guaranteed a tomorrow so today is what we have. Let’s use it for the GOOD! Let’s get to the end of each day and feel a sense of pride that today we made a contribution in the world. Keep dreaming, and dream big! The last one obviously was awesome. The difference between price and value. This one made me so excited and of course it is self-explanatory! I hope you too have been inspired by all this. It was an awesome day.